Today I'm going to be sharing with you the latest addition to my makeup bag: the Nivea Daily Essentials Express Hydration Primer. I picked this up from a supermarket a month or so ago when I was on the hunt for a more budget-friendly primer to replace my trusty Max Factor Facefinity All Day Primer, and I was definitely not disappointed. "This provides an even and smooth base for effective make-up application;helps your make-up stay put, absorbs instantly thanks to its light texture and uses an effective hydrator for lasting moisturisation." The product comes in two variants - one formula for dry/sensitive skin (with a pink lid) and one for normal/combination skin (with a blue lid), and I have the latter to suit my combination skin. One of the first things I noticed about this primer is how gorgeous the consistency is. It's so refreshing first thing in the morning and leaves my skin looking so healthy. Also, a little goes a long way so you hardly need any product to completely prime your face to perfection. I also noticed that, as if by magic, my skin looked instantly refreshed and awake as soon as I applied the primer. It turned my ever so tired face into something bright eyed bushy tailed, and we all need that of a morning, don't we? The primer has a lovely silky smooth lightweight feel on the skin and was absorbed into my skin almost instantly, so there's no more having to faff about waiting for your primer to sink in before you can start your makeup; giving you an extra five minutes or so in bed! Using this product ensured that my foundation (Bourjois Healthy Mix Serum if you're interested) and concealer (Collection Lasting Perfection) stayed put all day long and actually made my 'base' makeup application considerably easier, which gets a huge thumbs up from me. 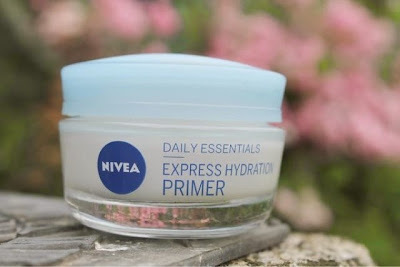 Not only is this a primer, but also a rather fantastic moisturiser. It does a fantastic job of keeping my skin all lovely and moisturised throughout the day, to the point where I don't actually need to use a separate moisturiser in the morning. This cuts out the middle man which makes it not only more convenient and fuss-free but also much better on the old bank balance. Another benefit of this primer, is the amount of product you get for your money. It comes in a pot of 50ml, which I do believe is considerably larger than your average primer, so definitely a product for the more frugal ones amongst us. This product retails at around £4.99 (although I do believe you can currently pick it up from Boots for £2.49 so be quick and grab yourselves a bargain). I'd definitely recommend trying this product if you're not really a primer person, maybe because of the heaviness of some products for example, because it will honestly convert you. You get all the bonuses a good primer can bring, without really noticing it's even on your skin. I would honestly purchase this product again in a heartbeat. For a budget primer, there is literally nothing negative I can say about it, and I can't imagine my morning beauty routine without it. I can't lie, my loyalty does still lie with my Max Factor primer but I think this will do just fine for a good everyday primer, leaving Max Factor to tackle the slightly more special occasions. Well done Nivea, this product has won a place in my heart. What is your current favourite primer? We both have the same make-up base Bourjois Healthy Mix Serum, Collection Lasting Perfection Concealer and that primer. Sadly mine had just run out, they last for ages! I need to get one now if they're on offer in Boots! I've used this primer before and absolutely loved it. It did feel like silk upon the skin and would be something I'll defiantly purchase again.